Towards the end of his reign King João V of Portugal (1706-50) made the renovation of the chapel dedicated to the Holy Spirit and St John the Baptist, in the Jesuit church of São Roque, into an impressive statement of his cultural ambitions for Lisbon, and an assertion of the status and power of his kingdom. The total transformation of the chapel in its architecture, sculpture, sumptuous gold and silver decoration, and its precious liturgical objects and textiles represents a commission of outstanding cohesion as well as extravagant financial cost, carried out in an extremely short period of time between 1742 and 1747. All the more remarkable is the fact that everything was executed in Rome by prestigious Italian architects, artists and craftsmen. The many and complex parts of the chapel were assembled first in Rome, and then disassembled and conveyed by boat to Lisbon, where they were then reassembled. The project was managed and supervised by the Portuguese ambassador, Commander Manuel Pereira de Sampaio, to whom Father João Baptista Carbone sent a letter on behalf of the king, on 26th October 1742, initiating this astonishing project. The present lavishly illustrated volume of fewer than 200 pages is a detailed commentary on the project with an initial discussion of its relationship to other of the king’s projects and political aspirations. Interesting is the reference to the king’s desire for increasing reform and control over the church. His insistence that all bishops of Lisbon be created Cardinal Patriarchates brought him into conflict with the Pope in 1728, who eventually acquiesced. 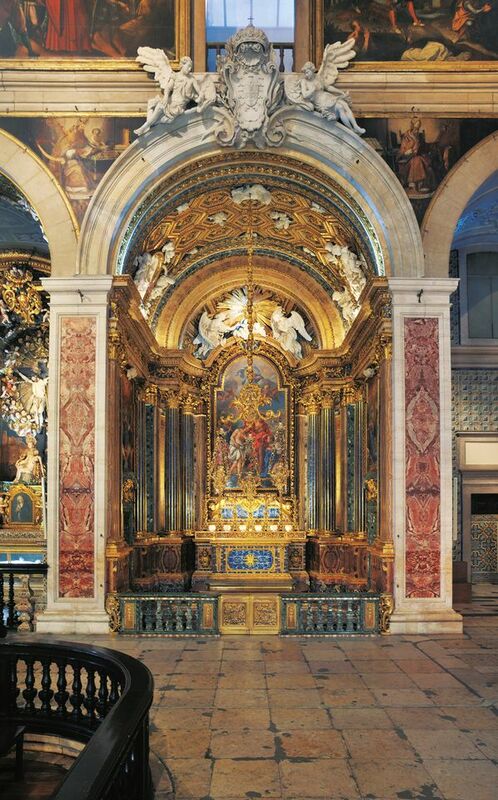 The chapel’s creation 20 years later symbolised a reconciliation between Pope Benedict XIV, who blessed the chapel before its delivery, and King João V. The book is the result of the detailed study, extensive conservation and restoration of the chapel, initiated in 2006. Various authors have contributed to the chapters discussing every aspect of the project, and analysing the extensive correspondence, documents and plans that passed backwards and forwards between Portugal and Rome. Commander de Sampaio was successful in acquiring the services of the leading architects in Rome, Nicola Salvi and Luigi Vanvitelli. These two architects were jointly responsible not only for the planning and design of the chapel, but also for approving expenditure and controlling the quality of the work carried out by all the other designers and craftsmen. The sculptural decoration was conceived as an integral part of the architecture, but the documentation is not as informative as for other parts of the project. As might be expected, the use of extensive gilded silver and metal, for which there are detailed illustrations, for the side doors and other details was the result of Portuguese control of Brazil. The final chapters of this fascinating survey deal with the extraordinary and important survival of sumptuous vestments and other textiles, such as three finely woven carpets, one of which survives in the Museum of São Roque. Although such items more often came from France at this time, the chapel’s outstanding embroideries were made in Rome and here again there is a fascinating explanation of the various personalities and workshops involved in their creation. The project also encompassed the commissioning of the everyday linens and vestments, and these too were made in Rome. The co-ordinator of the production of over 220 of these pieces was a noblewoman, Maria Anna Cenci Bolognetti, whose brother Mario had recently been raised to the rank of cardinal in 1743 by Pope Benedict XIV.